Bluecoat 9009 is recommended for durable finish with a stiff handle on textiles of all kinds. There is no loss of fight fastness or yellowing of the finished fabric. Finish produced, incorporating Bluecoat 9009 is not affected by change in weather conditions. Bluecoat 9009 is generally applied by padding. They may, however, also be applied on the winch the jig, the vat or by spraying onto the goods, in high concentrations, or in combination with products of high viscosity, the squeegee may be used. The temperature of the liquor should be between 20-70 C depending on the wetting capacity of the goods. In the case of woven articles which for reasons of economy, are not given a subsequent finish, Bluecoat 9009 m ay be applied in the size. To obtain homogeneous dispersion, very little quantity of water is added in the product, in portions while thoroughly pasting and mixing. After obtaining uniform dilution. It can further be diluted as desired. The liquor should be stirred from time to time since Bluecoat 9009 tends to settle out. 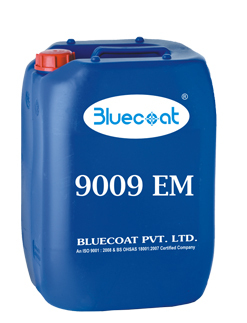 Bluecoat 9009 can also be used in permanent finishing liquors and together with various waterproofing agents. As the composition of these agents vary, preliminary experiments to test their compatibility with Bluecoat 9009 should be carried out. The product can also be applied in neutral or slightly alkaline solutions. After the finishing process has been completed, the machines used must be cleaned immediately by spraying or washing with water as otherwise, because of the high adhesive power of Bluecoat 9009, intensive mechanical cleaning will be necessary. The drying temperature should not be below 80° C. The stiffness of the finished goods and their fastness to washing improve as the drying temperature increases. Drying is preferably carried out on the stenter. When working on a cylinder drying machine, care must be taken that the material is well squeezed out before drying and that the first cylinders are wrapped with cloth. The temperature for calendaring should not exceed 60° C since otherwise the product because of its thermo - plasticity, might be deposited on the calendar rollers. Bluecoat 9009 can be stored in cool place & should not be exposed to sunlight. Container should be properly closed to avoid skin forming, before use remove any skin that may be formed due to surface evaporation and stir the mass with disinfected clean wooden rod to mix and homogenize the dilution that may have occurred in the top layer with settling in the lower layer. Bluecoat 9009 is available in wide open mouth 50-100 Kg and 200 Kg. Carbuoys which allows complete removal of material.